Loud & Proud – here comes the United States Navy! The 2017 California Capital Airshow is proud to host the VFA-106 Gladiators and their “Super” Hornet Tactical Demonstration! Come out to Mather Airport, September 9th & 10th, and experience the full-tilt capabilities of this extraordinary aircraft. The use of maximum-afterburner will leave you spellbound as the skies above Sacramento come alive with freedom’s roar! Absolutely nothing beats watching this mesmerizing show onsite. 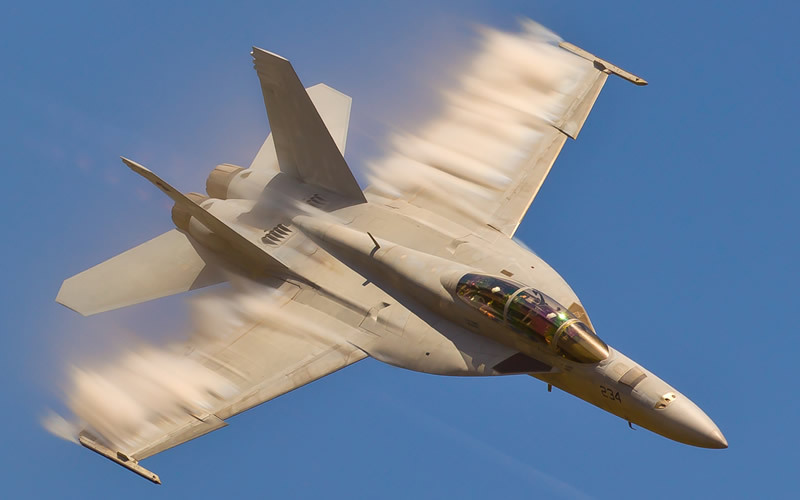 Get the inside scoop on the Super Hornet below! The VFA-106 “Super Hornet” Demo! All the way from Naval Air Station Oceana, Virginia, Strike Fighter Squadron 106 is proud to showcase the F/A-18 to audiences around the world. Airshows are the best place to see a Super Hornet in action. The Tactical Demonstration or “Tac Demo” team flies the F/A-18 as close to the “edge of the envelope” as safety and prudence allow. The routine highlights the Rhino’s maneuverability and slow-speed handling characteristics and is designed to showcase the mobility, versatility, and power of the F/A-18 for the citizens who look to the Navy for the defense of freedom. From the high “G” minimum radius turn to the slow speed “high-alpha” pass, the Demo flight puts the Rhino through its paces! Each maneuver is meticulously rehearsed by Demo Team aircrew, first in the simulator, then in a series of qualification and practice flights. Demo aircrew are Fleet veterans, chosen for their abilities, knowledge, and experience. Throughout the show, adherence to procedure and the safety of observers are paramount. 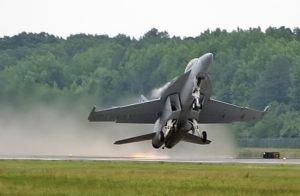 Although the maneuvers are dynamic, Demo team members adhere to guidelines established by VFA-106, the Navy, and the FAA to ensure their safety and that of the local community. Larger and heavier than the Legacy Hornet, the F/A-18 Super Hornet represents the 21st Century’s first truly multi-role fighter. Using the lessons learned from the original Hornet, the “Rhino” brings advances in avionics, weapons capabilities, radar and sensors, and stealth technology. The Rhino not only carries combat artillery but also can provide valuable reconnaissance and air-to-air refueling support to the U.S. Fleet. After entering service with the Fleet, the Rhino quickly found itself in combat in the skies over Afghanistan and Iraq. Its increased fuel and ordnance carriage make the Rhino an asset to American combat operations around the world. With the capability for future growth in weapons and on-board systems, the Rhino will remain a credible strike-fighter for years to come. Designed and initially produced by McDonnell Douglas, the Super Hornet first flew in 1995. Full-rate production began in September 1997, after the merger of McDonnell Douglas and Boeing the previous month. The Super Hornet entered service with the United States Navy in 1999, replacing the Grumman F-14 Tomcat, which was retired in 2006; the Super Hornet serves alongside the original Hornet. 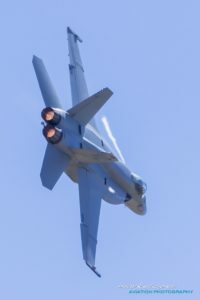 The Royal Australian Air Force (RAAF), which has operated the F/A-18A as its main fighter since 1984, ordered the F/A-18F in 2007 to replace its aging F-111C fleet. RAAF Super Hornets entered service in December 2010. You will want to be up close to the action this September when this intimidating creature takes off for some wild fun!